MLA style refers to a specific formatting style created by the Modern Language Association. MLA is most commonly used by students and scholars in the humanities and liberal arts when writing papers and citing sources. MLA Style uses a brief in-text citation and a full citation on a works cited page. Examples of MLA citations can be found by source in the box on below or from the drop down MLA menu. This section covers the basics of how to structure your research project, including how to select a topic, conducting research using library resources and online tools, keeping track of your research results and structuring your sources into a bibliography, selecting sources using evaluative criteria, making notes that track your thoughts and fuel your writing process, how to edit...and re-edit...and proofread...and edit again, and other important tasks necessary to successful research and writing. 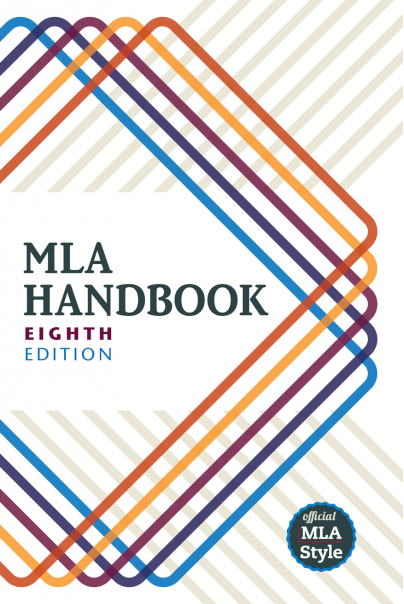 When you're writing a paper that's supposed to be fifteen pages long, but is stuck at ten pages (or overflowing at twenty pages), your research methods are producing the same five marginally useful sources over and over again, or you think you've written a thesis statement but your professor begs to differ - consult this portion of the MLA handbook and GET THE HELP YOU NEED! A charge of plagiarim carries severe consquences for your university career. If you are not certain what constitutes plagiarism or ways to avoid accidentally plagiarizing another person's content, read this section carefully and do as it says. Here you'll find information on the proper usage of punctuation marks; a topic on which we could all use a refresher, from time to time. Also, answer other elusive questions, such as whether that title should be italicized or place in quotation marks, or how to frame quotations using both quotation marks and the correct punctuation marks (e.g., do you need a period in addition to a question mark at the end of a quoted sentence?). There's also a section on how to format basic terms in foreign languages, which we musicians encounter on a daily basis. This section focuses on formatting the other "stuff" that you need to include in your paper other than the text, such as page numbers, tables and charts, and musical examples. This is the section with all the citation examples. If you want to quickly find the source type you are trying to cite in this chapter, refer to the index that starts on page 123. MLA citation style can include foot- or end notes, but it more typically uses parenthetical citations that appear within the text of the document inside parentheses. While there are fewer variations of parenthetical citation than in a list of works cited, there's enough variation to form a short chapter. Abbreviations, when used consistently, can smooth the reading experience. Here you'll find lists of words that are usually abbreviated, like U.S. states, or file types (how exactly do you refer to a PDF in print?). There's a literature bent to this chapter, so it include abbreviations for texts by Chaucer and books of the Bible. If you need assistance with music abbreviations, refer to D. Kern Holoman's book Writing about Music: a Style Sheet (available as an e-book via the Music Library).